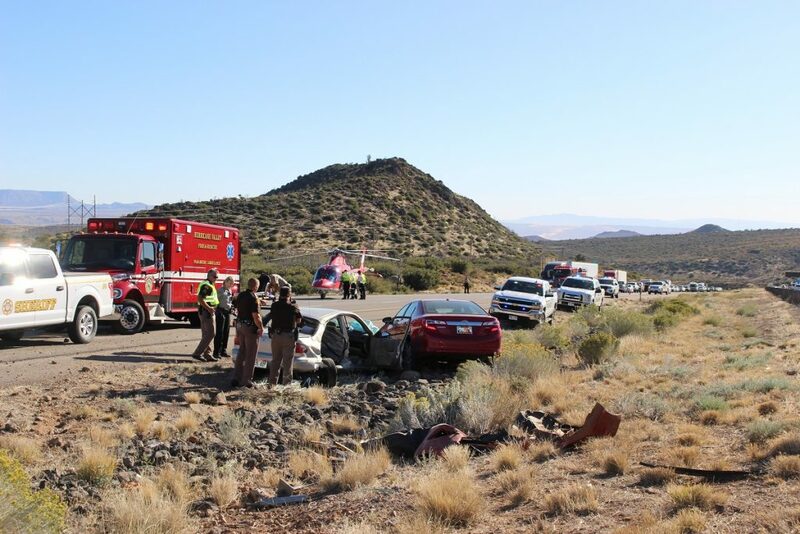 WASHINGTON COUNTY — A passenger in a two-car crash on Interstate 15 was flown to the hospital with near-fatal injuries Saturday afternoon. 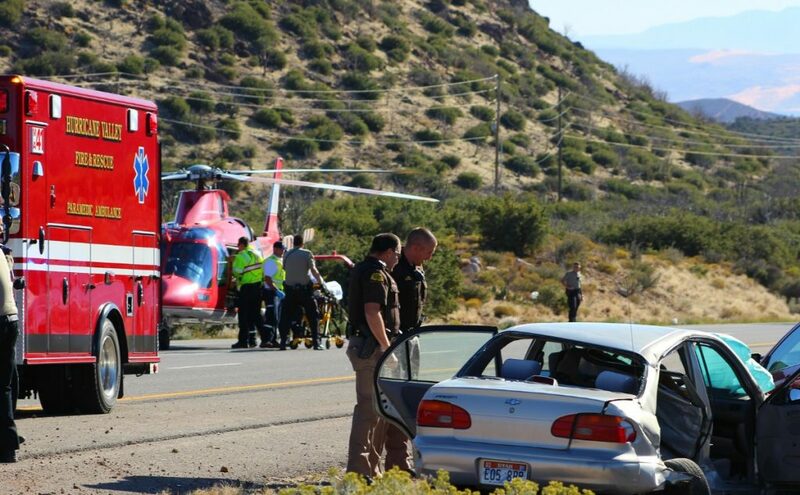 Two others, including a pregnant woman, were also injured in the crash that led to northbound I-15 becoming a landing site for a responding medical helicopter. At approximately 3:30 p.m. emergency personnel from multiple agencies were dispatched to the crash near Exit 30 involving a silver Chevrolet Prizm and a red Toyota Camry. 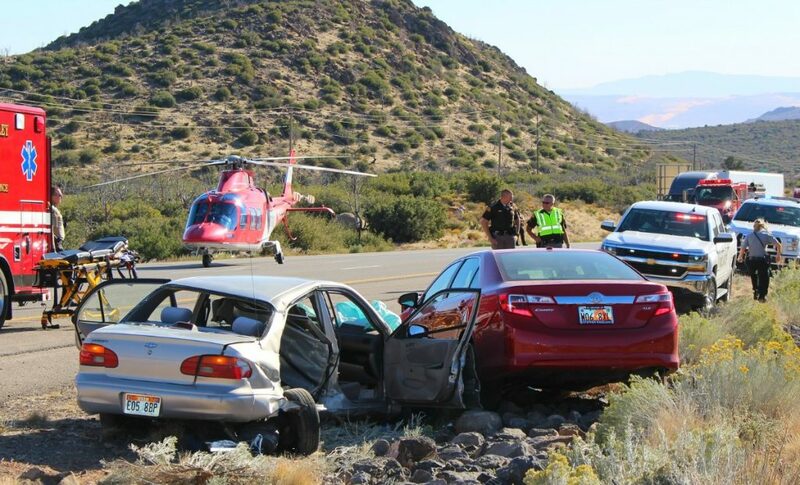 An Intermountain Life Flight crew was also dispatched due to the seriousness of the injuries. Upon arrival, officers found the driver inside the Chevrolet critically injured, and she was transported by ground to the hospital by ambulance. 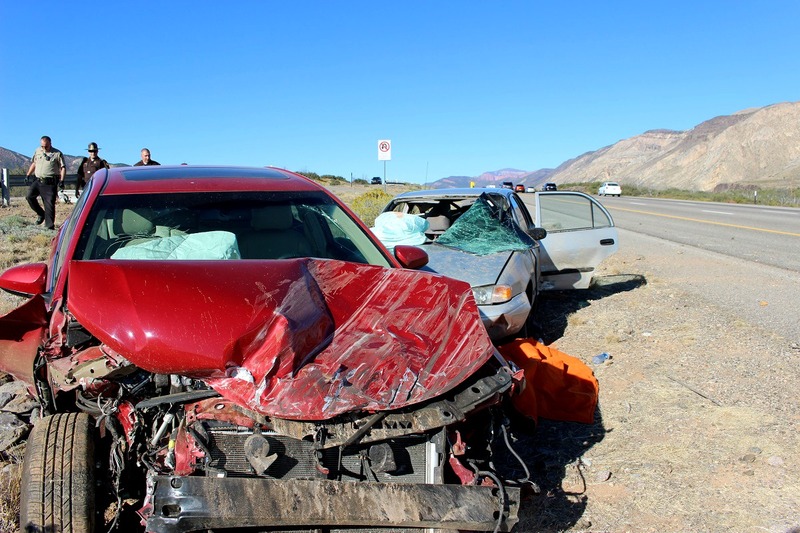 The passenger in the Chevrolet was “in the most serious condition and he was flown to the hospital by Life Flight,” Utah Highway Patrol Sgt. Larry Mower said. A witness at the scene said a Bureau of Land Management ranger was among the first to arrive and provided life-saving treatment to the man until EMTs arrived. 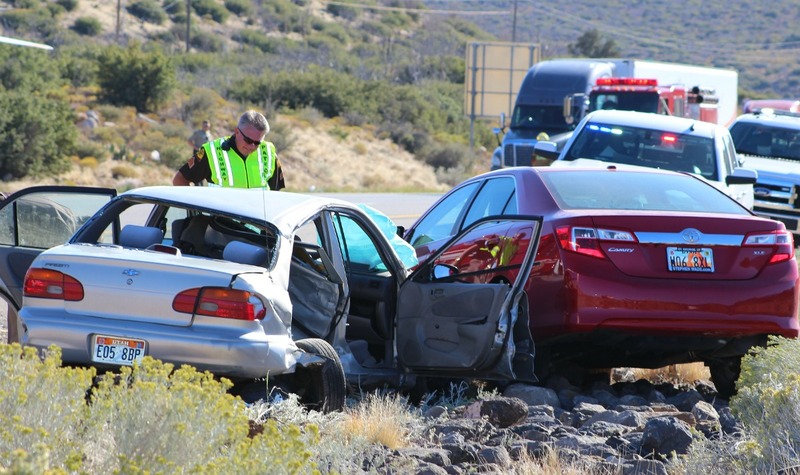 The red Toyota Camry was carrying four occupants, including two children who were properly restrained in their car seats and uninjured, along with a pregnant passenger who was transported to the hospital by ambulance for evaluation and treatment. “EMTs were more concerned that she was pregnant and wanted to get her to the hospital to be evaluated and treated for minor injuries,” Mower said. The woman driving the Toyota reported no injuries. 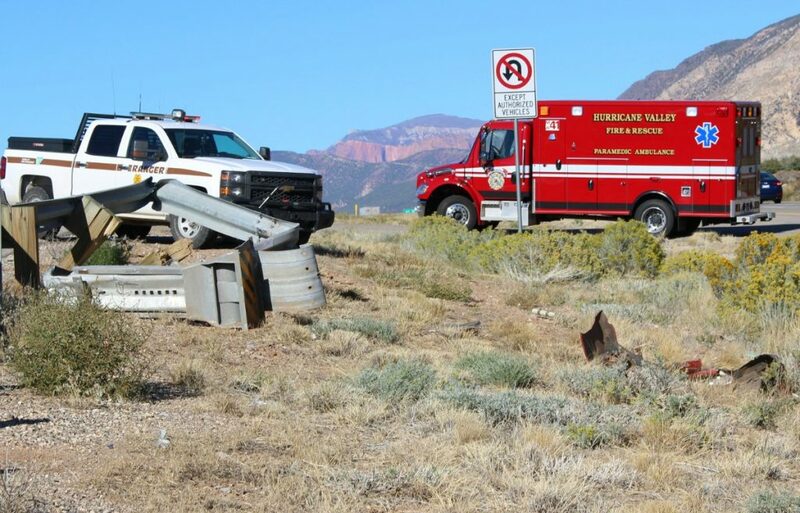 Troopers investigating the crash determined that the Chevrolet was southbound on I-15 in the outside lane when the driver came up behind a slower-moving semitractor-trailer and decided to switch lanes to pass the truck. Meanwhile, the Toyota was being driven south in the inside lane and was struck on the passenger’s side of the vehicle by the Chevrolet as its driver changed lanes. The impact spun the vehicles around and sent the Toyota into the grassy median. The Chevrolet was slammed sideways into the guardrail during the impact and continued skidding until it struck the Toyota a second time, coming to rest smashed into the passenger’s side front bumper. 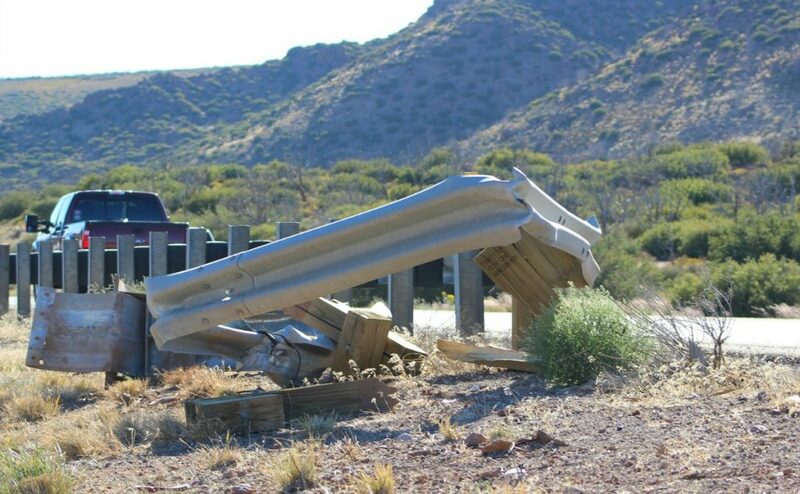 A large section of metal on the passenger’s side of the Chevrolet was torn away and its windows shattered as the car took out more than 25 feet of guardrail during the impact. Troopers also found that the man sitting in the front of the Chevrolet was partially ejected through the windshield, which contributed to the critical injuries he sustained, Mower said, adding that the driver suffered injuries to her upper and lower chest area. All but one of the people involved in the crash were properly restrained in seat belts. Mower said a seat belt not worn properly can increase the seriousness of injuries and may not prevent an individual from being ejected during a crash. A seat belt tucked under the arm or moved away from the muscular shoulder area can’t protect an individual against the extreme forces one experiences during a crash, he added, which could result in internal injuries to vital organs. “We want everyone to not only wear a seat belt but to wear it properly so it can do what it is designed to do – keep you inside of the vehicle and reduce the risk of injury,” Mower said. Just as Life Flight was taking off, a loud crashing sound came from the southbound side of the Interstate when a metal object appeared to fall off a pickup truck and break apart on the roadway as the truck approached the scene of the crash, causing one vehicle to swerve across the roadway to avoid hitting the object. The crashing sound also caused several people standing near the scene of the crash to run from the area to avoid the possibility of being struck by flying objects. No one was hurt, and the truck and the other vehicle recovered from the situation. 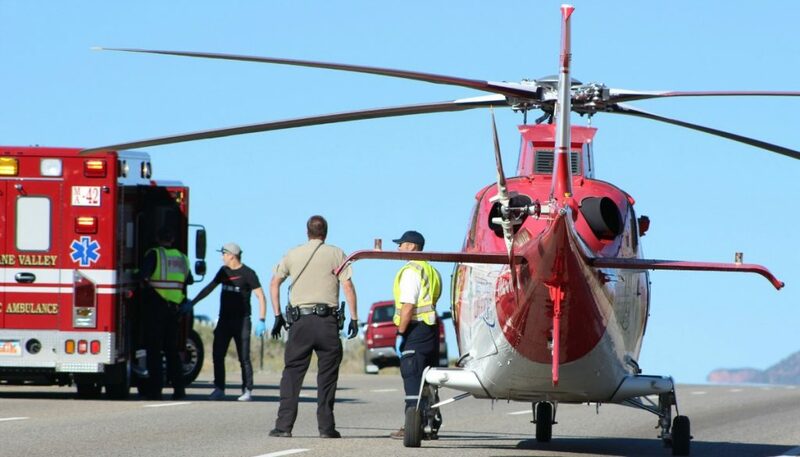 The northbound side of I-15 was completely shut down for nearly an hour as Life Flight landed and emergency personnel tended to the injured while 37 mph winds whipped through the area, creating difficulties for the Life Flight crew during take-off. The critically injured passenger of the Chevrolet was flown to Dixie Regional Medical Center and was in unstable condition as of 7:31 p.m. 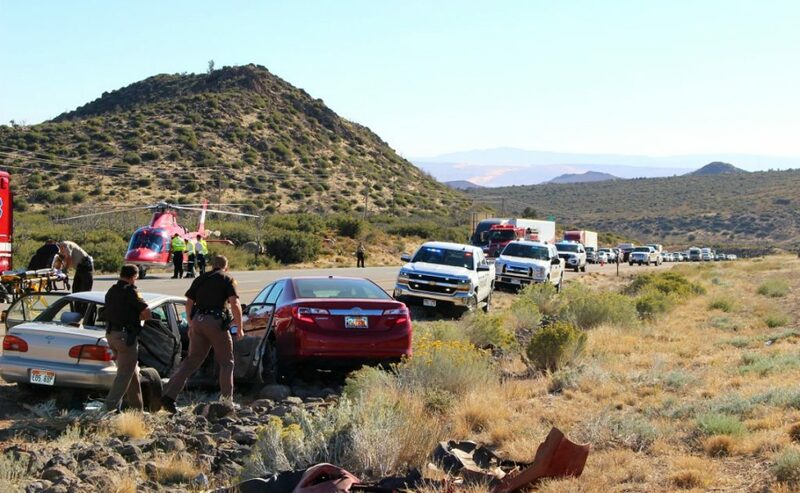 The Utah Highway Patrol, Washington County Sheriff’s Office, Hurricane Valley Fire and Rescue, Laverkin Police Department, Bureau of Land Management and Intermountain Life Flight responded to the scene. It’s pretty easy to judge how fast ands,slow a vehicle is going ahead of you especially a semi.. but passing on the right is always dangerous..it’s better to wait. But the driver should have looked before trying to change lanes to the right ..hop everyone. Is okay. I understood the article to describe the red Toyota to be occupying the inside lane and the silver Chevrolet in the outside (far right lane) lane, whose driver made the bad decision to switch lanes without looking back and to the side before moving left and colliding with the red car. Silver will receive the citation.